Welcome families to Pack 297! Our Official Website is Actually on Scoutbook, but it does not have a public access page so we use this for new folks to find out how to contact us! Our Pack meetings are held the 4th Tuesday of the month at the Sun City Elk's Lodge located at 10760 W Union Hills Dr, Sun City, AZ 85373. We are down stairs in the scout room. Our meetings start at 6:30pm and end no later than 8pm. Dens (smaller groups) meet 2-3 times a month depending on the rank. 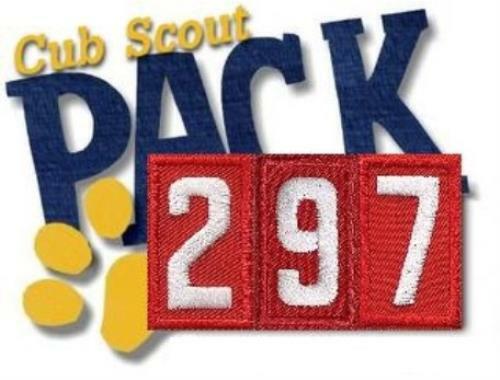 For more information about our pack please contact the Cubmaster Joe Ditmer at jmditmer@msn.com or call/text at 602-326-1170. Interested in scouting or want to register for the 2019-2020 scouting year? Come to our informative Round-up where you can learn all about our exciting adventures! Our meetings are held in the Sun City Elk's Lodge located at 10760 W Union Hills Dr., Sun City, AZ 85373. We meet down stairs in the scout room-park in back. Come ready to sign up for a fun exciting year. Fee schedule is listed below, but if that is an issue be sure to let someone know as we do have some scholarships available. If you have any questions please don't hesitate to reach out to us by either clicking contact our pack above or emailing christi_sadler@yahoo.com or Joe the Assistant Cubmaster jmditmer@msn.com. NOTE: Missed Roundup? No worries just contact me and we will get you started. Our program fees cover 1 FULL year* of FUN, membership to the Boy Scouts of America as well as to Pack 297. If there are ANY financial hardships please call the Cubmaster, Committee Chair or Treasurer before making that the only reason you don't join in the fun. We do have a few Scholarships/Scouterships and some scouts have handed down their uniforms when they graduate. And some awards purchased prior to our fundraising activity in October. *Fees listed above do NOT include Uniform, Insignia/Patches, Field Trips, Camping, Events, Den Dues ($1-$2 per meeting) or all of the awards your son will earn. A boy earns an average of $120 in awards each year. For awards the boys hold 2 fundraising activities, 1 in fall & 1 in spring. These activities help scouts build confidence in themselves and develop communication skills required in today’s ever advancing world. We do not ask our volunteer leaders to pay for BSA registration - some of the cost helps cover this. Boy Scouts of America (BSA) funds its many camp grounds and the few paid executives they have in each state through the Friends of Scouting fundraiser held in spring. This is where friends, family and companies of fellow scouts make a tax deductible donation to support scouting. Please review the attached Bylaws at any time, but especially when joining the pack and signing the agreement. Any questions, don't hesitate to reach out.